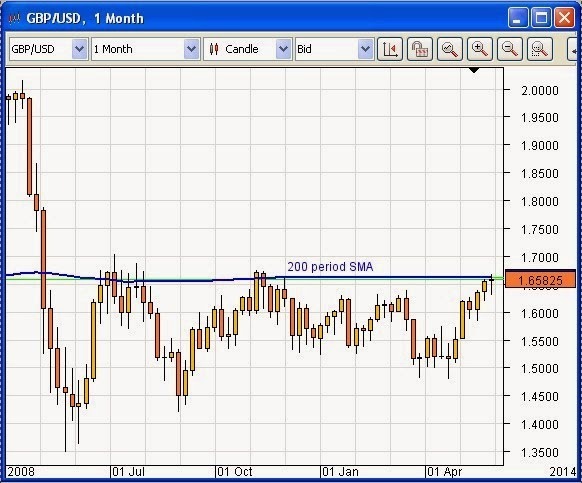 OmiCronFX : Sterling after a bumper retail sales report | Why is the Aussie on fire? 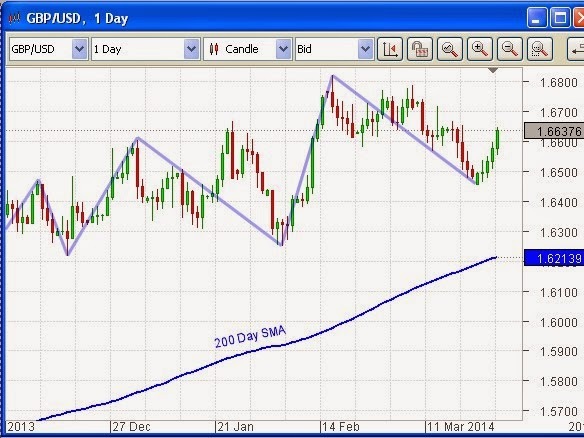 Sterling after a bumper retail sales report | Why is the Aussie on fire? The pound Sterling against the US dollar (GBPUSD) is powering aggressively in the upward direction once again, on the back of the excellent February retail sales figures that were released yesterday (GMT) – three times higher than had been expected according to a Reuters’ poll of economists. This is the instrument in which we had such goodtrading results last month (February). The long-term trend here is unmistakingly upward, even if it has taken a breather in recent weeks. The burning question for us is: Will this pair break convincingly through the substantial resistance that has been standing for a long time at 1.6645, the level of the 200 period Simple Moving Average on the monthly chart? It is now in that region once more. It is hard not to be conscious of the fact that Cable, as GBPUSD is otherwise known, was at and above the level of 2.00 US dollars back in 2008, just prior to the meltdown that took place as a result of the flight to safety in the wake of the Global Financial Crisis. Are we about to start on the journey up to that level again, now that the crisis seems to be fading into the past, at least to some degree? Why is the Aussie on fire? A few short weeks ago the governor of the Reserve Bank of Australia (RBA), Glenn Stevens, and a number of his colleagues, most notably Heather Rideout, were telling anyone who would listen that the Australian currency was way overvalued and that it was essential for the sake of the economy that it be weakened considerably. At the same time economic indicators in China, Australia’s biggest trade partner, were less than stellar, the cost of living in Oz was going through the roof and hard commodity prices, of which Australia exports a lot, were in the process of melting down. So what happened? The Aussie took off is what happened. Nobody listened to Mr. Stevens et al and traders apparently ignored all the other indicators. Or did they? We believe otherwise. 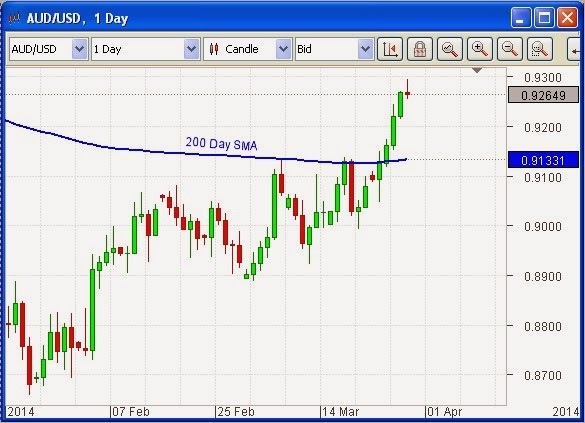 We believe that what took place is that a very large number of traders, some capable of trading with sizeable positions, saw that the daily chart was apparently forming a triple top against the 200 day Simple Moving Average (SMA) (see chart), noted the conditions described above, and went short (sold the Aussie). They placed stops (precautionary Stop-Loss orders) above the level of the 200 day SMA. Then, for one reason or another, price failed to respect this resistance level, and moved through it. Stops were triggered, and they are still being triggered. We are, in other words, in the midst of a classic short squeeze in the Australian dollar. A Stop Loss on a short trade is a buy order. Traders who have them triggered have exactly the same effect on the market as those who have taken a view that the market will rise. We had long been out of the Aussie because our bias is to be bearish on this currency and our Mandelbrot algorithmic routine will not allow us to hold a position when it is rising. Not only that, it will only permit us to re-enter when its algorithm has identified the strong probability that AUDUSD has started to trend down again. Sure, this invariably means that we miss the very top or bottom of a trend, but that is OK. It is the fact that we are most likely to be in a winning trade that is of supreme interest to us.